This post contains sponsored links from Tessemae's. I discovered a delicious summer salad that uses baby broccoli. I love broccoli so when I discover baby broccoli at my produce store I was excited to try it! If you have never had baby broccoli, then you are in for a treat. Baby broccoli is sweeter and more tender than regular broccoli. Unlike regular broccoli, the baby version has slimmer stalks that cook up much faster and taste wonderful. Baby broccoli, in my opinion, tastes better when steamed. It was lunch time and I wanted a veggie for my lunch. When I saw the baby broccoli in my fridge, I grabbed it and steamed it up. As it was steaming I decided to make it into a cranberry salad. I grabbed my roasted sunflower seeds and dried cranberries from the pantry. Then I went to my fridge to get a dressing for my salad. I grabbed my bottle of all natural Honey Balsamic dressing as I knew its sweet light taste would be perfect on my salad. The delicious honey balsamic taste comes from an all natural salad dressing that I am loving. 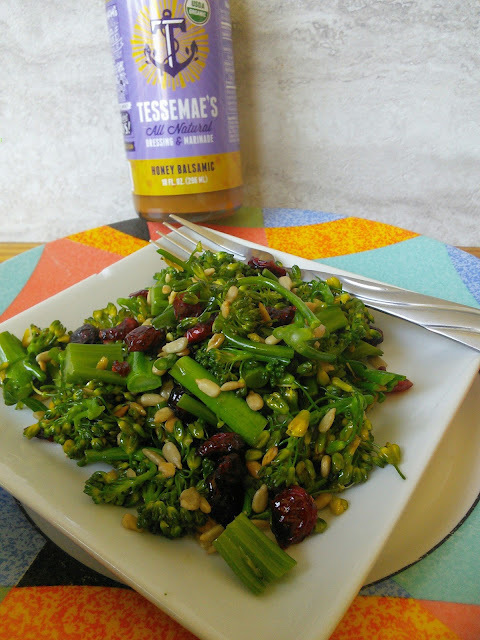 This dressing is made by Tessemae's and can be found in stores like Whole Foods, Heb, and Kroger. It tastes so good on my salads and veggies right now. I usually do not use dressing on my salads as most are full of salt, chemicals, and unhealthy fats. So when I discovered an all natural dressing that is made with real ingredients that I would use if I made it myself, I just had to try it. Ok, the cool looking bottles and flavors are what made me want to try these dressings. Once I read the ingredients, I felt good about using this all natural dressing. I first tried the Honey Balsamic dressing on a cole slaw mix that I had. This dressing added an amazing light flavor. My husband who is not a fan of cole slaw enjoyed this yummy mix on his fish tacos. I was enjoying this dressing so much that I am using a little bit on all the veggies I eat instead of using salt. 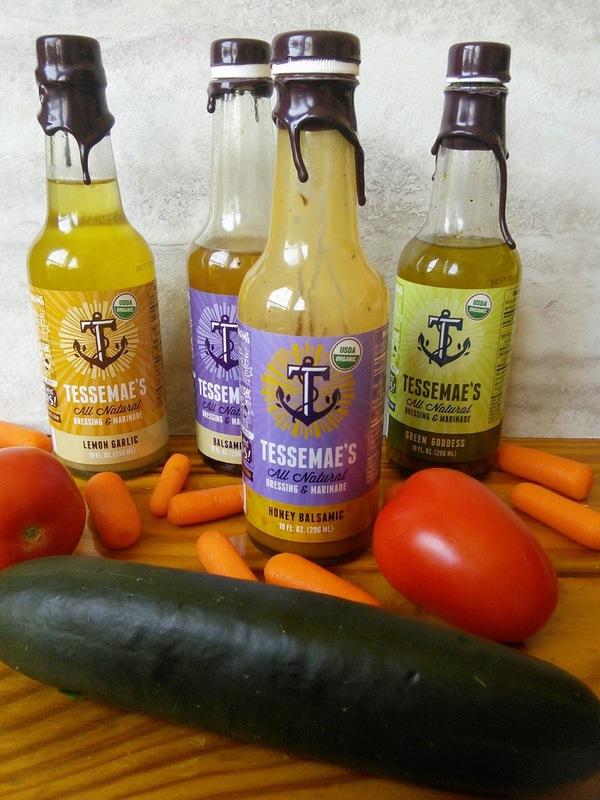 Tessemae’s All Natural product line includes many other flavors like Green Goddess, Lemon Garlic, Balsamic, and more. They make 25 delicious marinades and condiments that are made with real ingredients and no preservatives. All of Tessemae’s All-Natural products are USDA organic, gluten free, non-gmo, vegan and Whole30 approved- and contain no added sugar or xantham gum…ever! I love that they are low in sodium and have very little saturated fat. These dressings have the good fat from extra virgin olive oil and most of the ingredients are organic. I can feel good about using dressing on my salad and in my cooking. Did you know that using healthy oils on salads actually helps the body absorb the vitamins and minerals better? So if you have been looking for an all natural dressing for your veggies then check out the all natural line from Tessemae's. You can find them in stores like Heb, Kroger, and Whole Foods. Which dressing would like to try? Steam the baby broccoli and let cool. Once cooled, chop into bite size pieces. 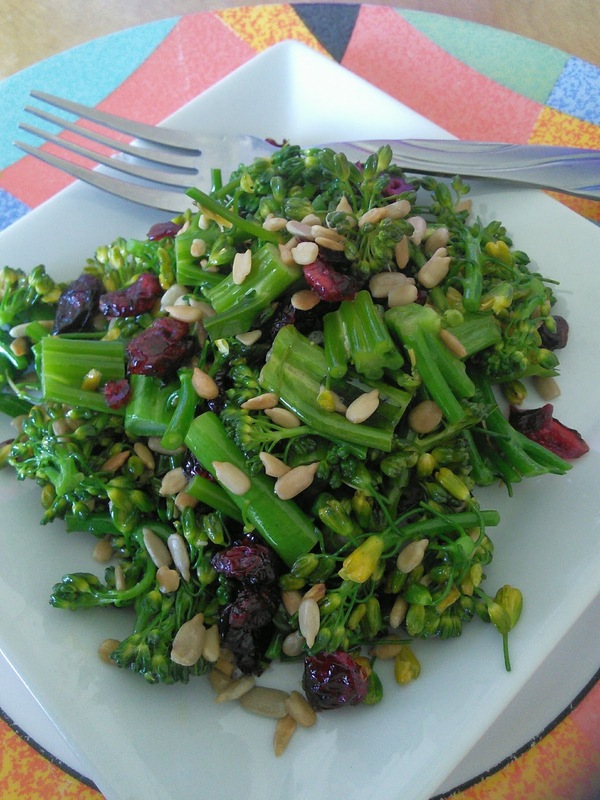 Toss the baby broccoli in a bowl with the Honey Balsamic dressing. Then add dried cranberries and sunflower seeds. Toss all ingredients together. This salad can be served right away or chilled for several hours to let the flavors mingle. Makes 4 servings. If you can't find baby broccoli at your store then use regular broccoli. This looks delicious! I'm going to have to try it this summer. I friggin LOVE baby broccoli!! Those salad dressings looks yummy and healthy. I love prepped up salad dressing, takes you a lot of time to do specially when you are in a hurry. That's such a nice salad to have during the summer! I love having different dressings, it makes eating salad a lot more exciting especially this summer! The flavors are my kind of flavors too. Great tastes! Lemon Garlic dressing were delicious on my chicken caesar salad! It was my favorite salad dressing! I am glad that you like the salad dressings! I haven't tried baby broccoli before. This looks yummy, I like to try that dressing. I love the dressing, will try it soon! I hope I can find baby broccoli. Ohh this looks delicious! I'm not sure I've ever seen baby broccoli in the store but I hope I can find it now! This looks amazing. I love broccoli. That looks so good! I actually have these dressings too and I'm happy I have the honey balsamic one. I'll be able to try out this recipe! We make something similar to this and its definitely a family hit! I love those dressings too! That does look good! I'll have to see if I can find Tessemae's. That looks so good! It reminds me of a packaged one similar that i bought a while ago. I would much rather prepare it myself and i'd eat that in a heartbeat! This looks so good, I love anything with cranberries in it. I also love broccoli any which way it's served and especially in a salad. I can't wait to try this recipe. I think salad are best enjoyed with yummy dressings! The Green Goddess Tessemae dressing sounds delicious to me! I don't eat Brocolli that much but this one's different. It looks very appetizing and appealing for my salty taste. Maybe it's because the Cranberries are complementing everything in an unusual but balanced way. This looks and sounds so yummy. I think I need it for lunch tomorrow. That salad looks so good! I always have to have cranberry in my salads, they add just the right amount of sweetness. I bet they taste extra good with brocolli! Adding this to my recipe! Oh, wow. This looks wonderful! Everything looks healthy and delicious. I'd totally devour that. Looks delicious and healthy food idea! I love green vegetables and this looks yummy and delicious. This looks delicious and fun to eat. I know my husband would love it. I've never seen a broccoli salad before but it looks good and healthy! I bet the cranberries give it a sweet taste.